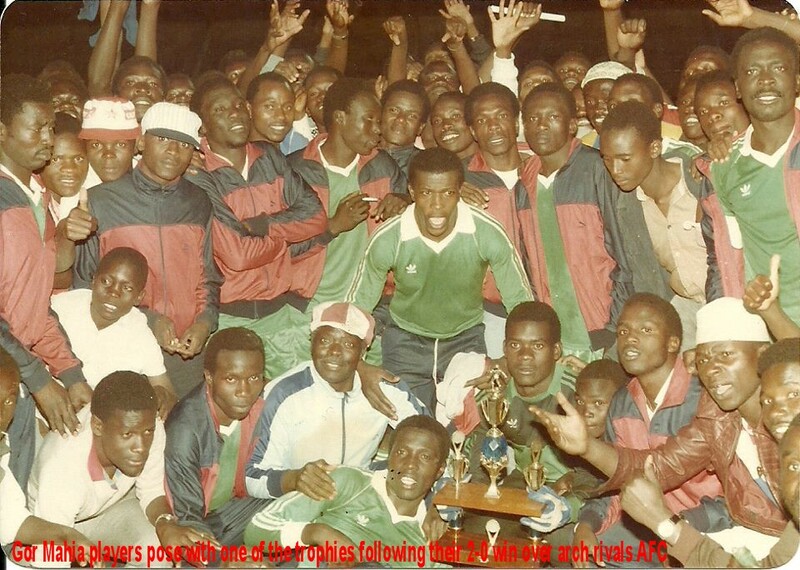 Kogalo ended their losing streak by beating Karturi sports club 1-0. It was quite an achievement considering that the Naivasha based side have been playing well of late and are placed in 4th position oin the KPL standings. Gor Mahia once again dominated the proceedings but could not find the back of the net. That was until the 62nd minute. Second half sub, Baldwin Ngwa was felled on the edge of the penalty box. Taking the resulting freekick, captain Julius Owino passed to new signing Kevin Omondi who beat Noah Ayuko in the Karturi goal with a curling drive. The goal was the first ever in an official game for Kevin Omondi who was signed after his stellar performance for Langata High school in last years national school games. The contest pitting traditional rivals Gor Mahia and AFC Leopards was attended by what is being described as the largest crowd seen in a local league match in decades. Attendance at local league matches has been plumetting over the past decade or so as more and more fans identify themselves with the English premier league. This past Wedensday however was a welcome departure from that trend. The Main stand was full to the brim as was the Russia and Soweto sections. 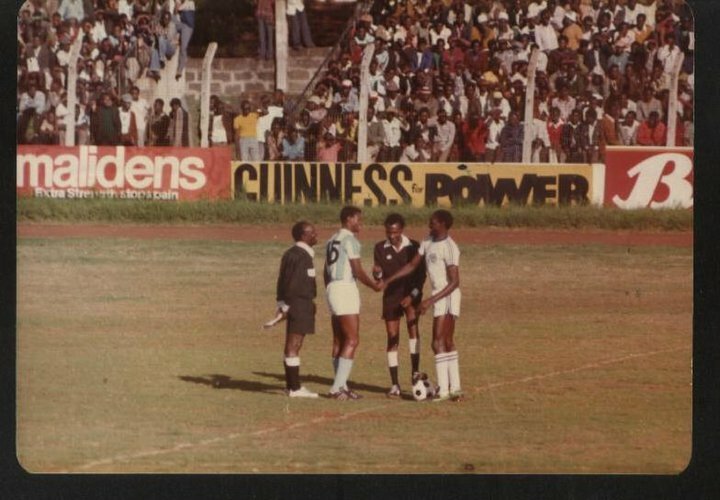 It is still not at par with games of two decades ago when Nyayo stadium was already full to the brim 1hr before the match. But its amazing in a country where the EPL craze seems to have taken hold. 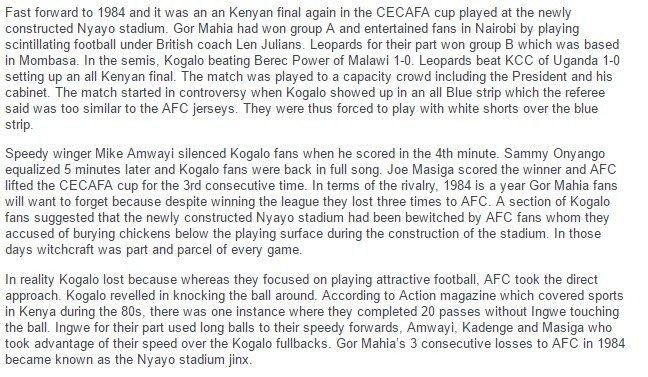 Passions were high as Kogalo fans blew the “Oporo” accompanied with songs and dances. Ingwe fans responded with their traditional Isukuti drums. 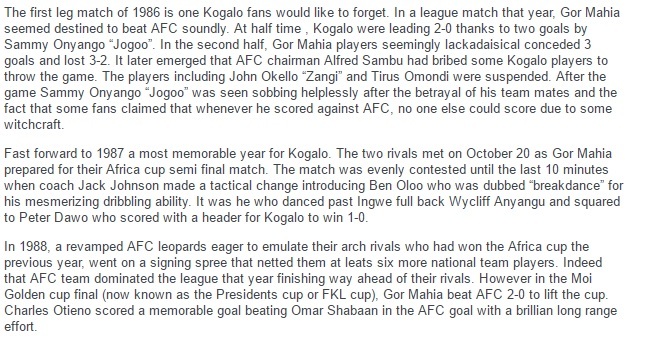 When Kogalo fans launched into the “Oliech-Obama-Odinga” chant, Ingwe fans responded with their own version: “Mariga-Mudavadi-Marende”. Both sets of fans are now sharply dressed in their favorite clubs jerseys. decades of decline. It is now up to club officials to step up their efforts in attracting more fans especially the younger generation. Fans should bring their children to games. When kids become fans at that young age, they are hooked for life. The two teams should also consider putting their differences aside and sourcing for sponsorship together. As the two most popular teams, they present a strong joint case for a sponsorship deal. But as seperate entities, thir case for sponsorship is much weaker because a company would fear alienating one set of supporters by sponsoring another. Gor Mahia went down to arch rivals AFC Leopards 0-1 in a well attended match played at Nyayo stadium under floodlights. Despite dominating the match for long periods, Kogalo were unable to find the back of the net. In part this was due to the goalkeeping of Lawrence Webo. 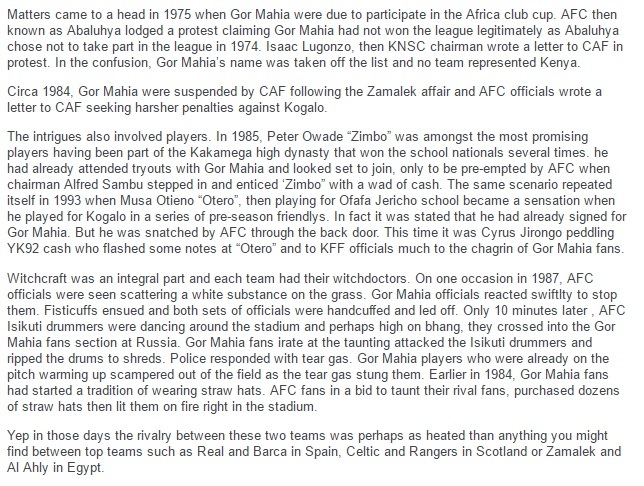 In part due to poor finishing on the part of Kogalo players. For the second game running, Kogalo lost again due to poor finishing and lack of poise, something coach Zico will have to emphasize in training. Gor Mahia went down 0-1 to KCB in an evently contested match at the city stadium. 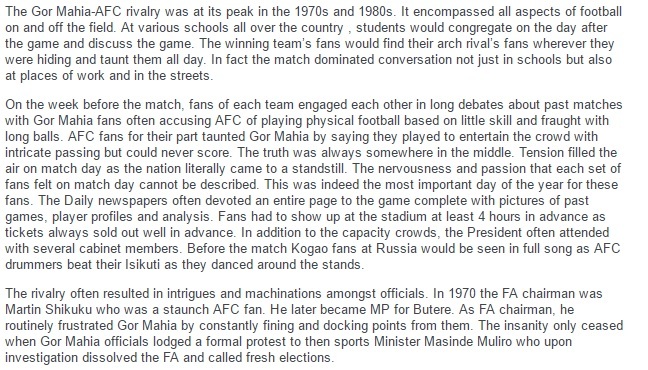 The match was the first part of a double header with the other match pitting AFC against Mahakama. After a barren first half , KCB scored thriugh a 72nd minute penalty after David Omweno was felled in the penalty box. It is proving to be an extremely tightly contested league with even the bottom teams giving a torrid time to the top teams. Gor Mahia officials, players and fans will have to raise their game in order to finish in a respectable position this year. Goal poacher, Duncan Owiti known for grabbing several crucial goals has been sidelined by an injury he picked up at the Harambee stars camp. Owiti’s excellent play had earned him a call up to the Harambee stars squad that was preparing for the CHAN encounter against Uganda. He will now be replaced by Allan Otindo of Karturi Sports club. Both Owiti and George Blackberry Odhiambo were scouted while they played for Nyanza province powerhouse, Thur Gem secondary school. Blackberry later moved to Kamkunji secondary in Nairobi. And since joining Kogalo Owiti has made an impact , often coming in as a super sub to score crucial goals and more recently as a starter. In the absense of Owiti, his place will likely be taken by Baldwin Ngwa. The flying Camerounian has yet to find the back of the net this year but has played well in various appearances. This supporter wishes Owiti a swift recovery. Kogalo came from behind to tie the KPL defending champions Sofapaka 1-1. 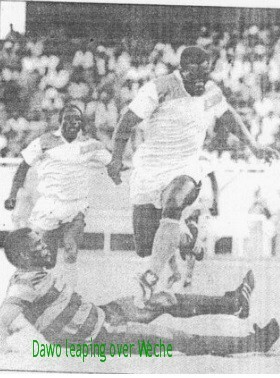 The latter had taken an early lead when last season’s leading scorer John Baraza scored from what seemed like an offside position. 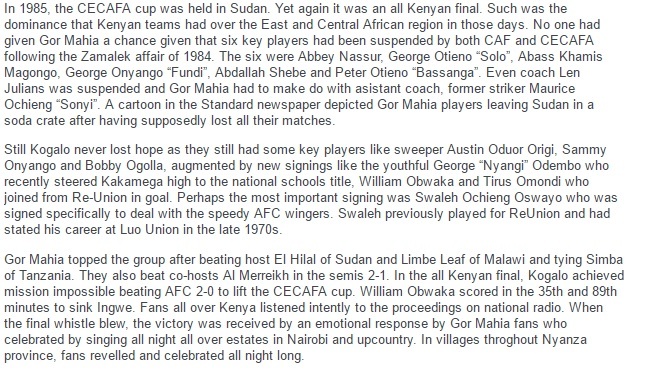 Gor Mahia fought back and eventually leveled the score via another penalty scored by captain Julius Owino. The penalty arose after substitute Francis Ocholla had been felled by the Sofapaka keeper. A tie was quite an achievement for the youthful Kogalo outfit considering that they were up against a side that has a half dozen internationals.